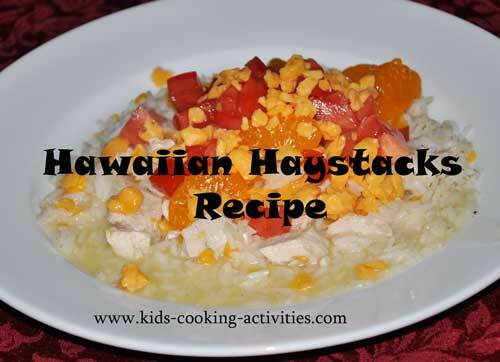 This Hawaiian Haystacks recipe is a fun kids meal where everyone can create their own rice haystack with sauce and toppings. It gets its Hawaiian name for the tropical fruit you add to the top and because you pile the toppings on like a haystack. Stir all ingredients together in a saucepan. Heat on medium-low. *If you would like a thicker sauce add less liquid to make a thinner sauce add more liquid. Have the following ingredients available as you desire and let everyone assemble their haystacks meal. Vegetable ideas: chopped tomatoes, celery, green peppers, onions, mushrooms, whatever you'd like or have available. 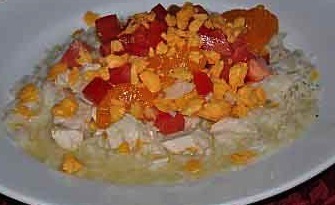 Let each family member add cooked rice to their bowl, shredded cheese then sauce. Top with vegetables, fruits and toppings of your choice.